Potassium Iodide Pill Source with RADSticker, NukAlert, FEMA Radiation Meters, MRE's, fallout shelters, etc. We've been promoting Civil Defense Training of the public for nearly two decades! 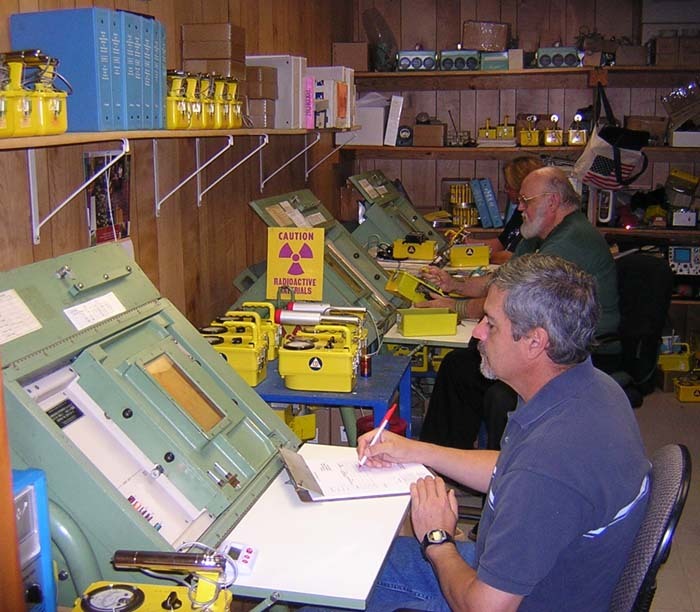 KI4U, Inc., is the only private radiological laboratory in the nation specializing in calibrating & re-certifying all of our country's Civil Defense radiation meters & dosimeters, and have 100,000+ instruments in inventory AND we distributed over 6 million doses of Potassium Iodide (KI) during Fukushima disaster! We also produce the popular NukAlert™ & are USA source of RADTriage™. 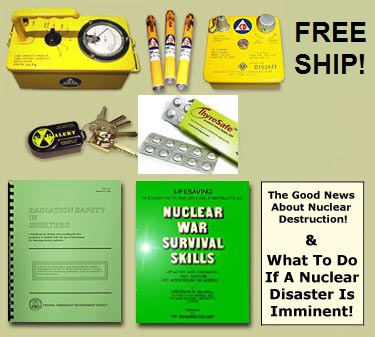 More about all that we do preparing First-Responders and our fellow Americans, including FREE family nuke prep survival guides HERE! ships same day when you call before 3PM CST. OR, order on-line the first couple items below. Read & share The Good News About Nuclear Destruction! - In-Stock w/ Free Shipping! life-saver for both First-Responders and the public." Save over $200.00 getting it all! $815.00 ea, w/ FREE shipping! Maximum of two of 'The Package' per order. Or, FREE UPS shipping, our choice. are temporarily sold-out, see note below. Contents bought individually adds up to over $1,000.00. You save over $200.00 buying them in 'The Package'! And, still with FREE shipping! - 1 Hard Copies of our popular 'Good News' article & 'What To Do If...' guide. NOTE: 'The Package' and NukAlert are the only products still offered directly online here. All our other products, as well as components of The Package, must be acquired by calling (830) 672-8734. No substitutions or additions to 'The Package' assures we can build them both complete and faster. All the components individually, add up to well over $1,000.00. And, we still have FREE shipping on it. USA sales only, call us at (830) 672-8734 to order or for buying individual components of 'The Package'. - Exclusively manufactured by & for KI4U, Inc.
- Note: NukAlert™ included in 'The Package' above. - Note: 4 ThyroSafe™ incl in 'The Package' above. 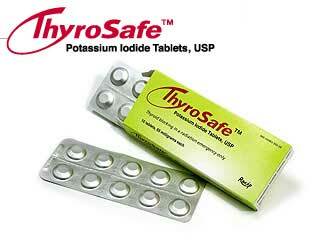 ThyroSafe™ is the only FDA approved Potassium Iodide (KI) tablet with 65 mg. strength. This is essential for promptly dosing children, who are always more at risk than adults. The FDA Guideline suggests: "For the sake of logistical simplicity in the dispensing and administration of KI to children, FDA recommends a 65-mg. dose as standard for all school-age children while allowing for the adult dose (130 mg., 2 X 65 mg. tablets) in adolescents approaching adult size." How KI protects your thyroid from radioactive iodine HERE including why it's expected to be the bigger relative threat the further downwind you are. All recently calibrated & certified! Call us at (830) 672-8734 to buy direct! - Note: (1) 715, (3) 742 & (1) 750 incl in 'The Package'. - Our low-range Geiger Counter instruments are here. - Yes, we can calibrate your CD meter here. These same, field-proven for decades, FEMA Civil Defense radiation meters and dosimeters are still in-use by thousands of First-Responders across the country! Our calibration sticker assures the device meets the current standards of the U.S. Nuclear Industry and the FEMA calibration program. Manual included, uses common 'D' cell batteries, not incl. 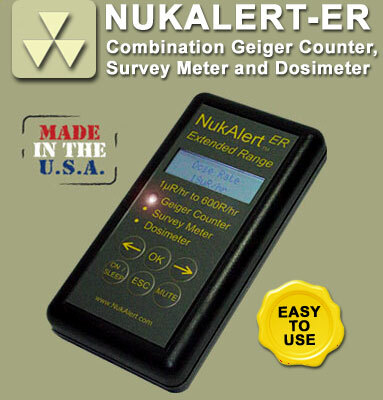 Our low-range Geiger Counter instruments are offered here, though most sold out. 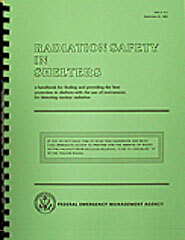 The essential FEMA 120 page 'Radiation Safety In Shelters' handbook below is highly recommended for anyone acquiring any of these instruments. It is specifically written for non-scientists using these exact same CD instruments during an actual nuclear crisis. at our lab here conforming to the standards as set forth by the State of Texas, FEMA, ASTM and the NRC. 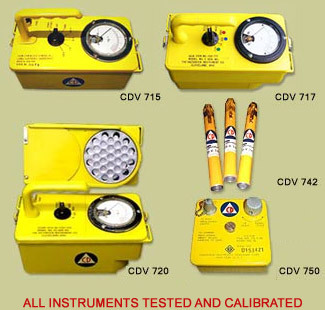 instruments, and have 100,000+ survey meters & dosimeters in inventory that we are working through to certify & release. We've also started accepting outside calibration work again, where you send us your CD meters to be calibrated here. 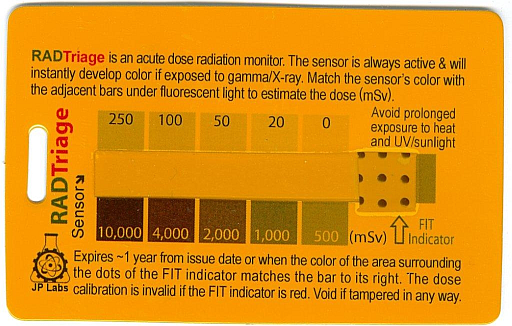 "It is an essential and urgent step in the protection of our public from a nuclear or radiological event that every person have this inexpensive and appropriate RADTriage™ to both ensure them they need not panic about radiation exposure, or to alert the very few who might be approaching a serious dose to take shielding. It is the most important step to filling the current gap in radiological civil defense and education of the public." Call us at (830) 672-8734 to buy RADTriage cards. 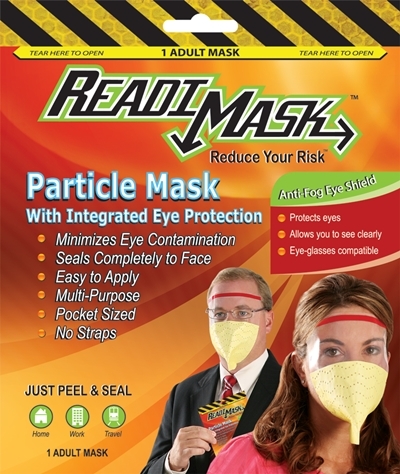 Note: (1) RADTriage™ card included in 'The Package' above. Call (830) 672-8735 To Buy! 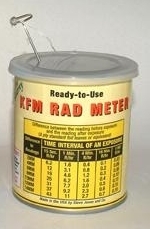 - Detailed info about the KFM Fallout Meter here. - No batteries required (electrostatically energised). - Ages 13+ Great Science Project, too! - Note: (2) Adult sized incl in 'The Package' above. Call (830) 672-8734 to order. - Note: (1) copy included in 'The Package' above. - Grab FREE pdf (30mb) version here. This is the 'bible' of public Nuclear Preparedness, both easy to grasp and understand the threats and chocked full of pactical and easy to implement solutions to minimize radiation exposure to As Low As Reasonably Achievable. Originally published by Oak Ridge National Laboratory, a Facility of the U.S. Department of Energy. For the vast majority of Americans who would receive radiation doses from a massive attack, the help of doctors, antibiotics, blood transfusions, etc., would not be of life-or-death importance. Very few of those receiving acute doses (received within 24 hours) of less than 100 R would become sick, even briefly. All of those exposed to acute doses between 100 R and 200 R should recover from radiation effects. However, under post-attack conditions of multiple stresses and privations, some who receive acute radiation doses of 100 R to 200 R may die of infectious diseases because of their reduced resistance. If total doses this size or even several times larger are received over a period of a few months in small doses of around 6 R per day, no incapacitating symptoms should result. The human body usually can repair almost all radiation damage if the daily doses are not too large. The majority of those with acute doses of less than about 350 R will recover without medical treatment. Almost all of those receiving acute doses of over 600 R would die within a few weeks, even if they were to receive treatment in a typical hospital during peacetime. The most effective way to reduce losses of health and life from radiation sickness is to prevent excessive exposure to radiation. Adequate shelter and essential life-support items are the best means of saving lives in a nuclear war. - See & read it on-line free here. This 120 page FEMA handbook is the best instructional resource for the practical field use of the specific Civil Defense instruments sold above in a for-real nuclear emergency. Subtitled: "A handbook for finding and providing the best protection in shelters with the use of instruments for detecting nuclear radiation." This practical manual goes far beyond the limited coverage included in the brief manuals that come with the FEMA Civil Defense survey meters and dosimeters. This is a must-have reference for anyone with CD instruments. Note: (1) copy included in 'The Package' above. This 650 page book was at one time classified TOP SECRET. It is now UNCLASSIFIED, but still has the SAME information in it when it was TOP SECRET. 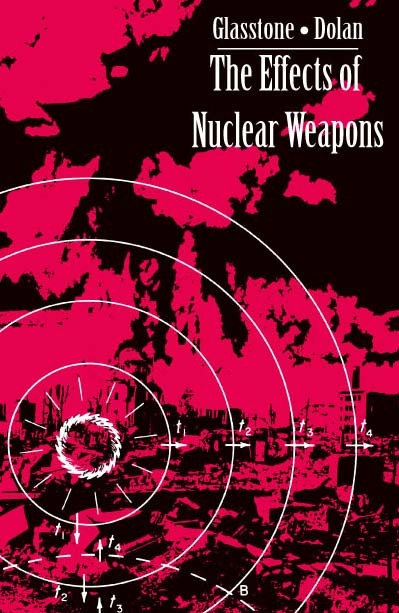 The DoD's classic and comprehensive 'bible' on the effects of Nuclear Weapons, written with extreme scientific detail, is a MUST HAVE for anyone working in Homeland Security, Emergency Services or in any other Civil Defense capacity. 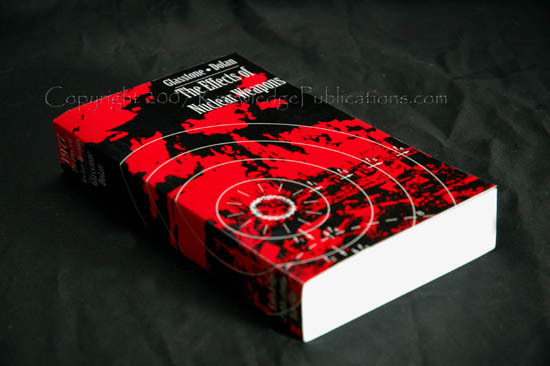 With this book you can KNOW the effects of a weapon at any distance, including blast speed, overpressure, prompt radiation, thermal radiation, fall out values and timeline, along with everything else, like EMP. It can even tell you potential crater sizes. The reverse is true as well. If terrorists were to set off a nuke on the ground, measurement of the crater would indicate the yield of the weapon used. Glass windows broken at X miles away would also indicate the yield of the device with this book. This book is especially important for information services that must be able to provide accurate information in the aftermath of a NUCLEAR ATTACK. If you want to know what a 5 Kiloton stolen Soviet suitcase nuke would do, this book will tell you without requiring that you know everything that nuclear scientists know. Note: (1) copy included in 'The Package' above. Hard cover, 270 pages, published in 2011. Practical Family Nuke Survival Strategies (and more) from real world experience on the ground from a scientist whose been where few others have tread. This is a must-have in your survival library, chocked full of practical how-to's for surviving in the hot zone from a man who has. FREE RadTriage Card with every copy!! - Note: (1) copy included in 'The Package' seen above. - THE Civil Defense, Survival & Prep Ultimate Collection! - Call (830) 672-8734 to order. This is the ultimate DVD production of nuclear preparedness material that covers ALL the bases, including a full all-hazards approach to everyday worries, natural and manmade disasters, terrorism, and family preparedness goals. In developing this DVD, we created an easy to use information package that can be put on any computer with a DVD drive, and used offline or online, to educate and inform individuals, families, neighbors, and entire communities. 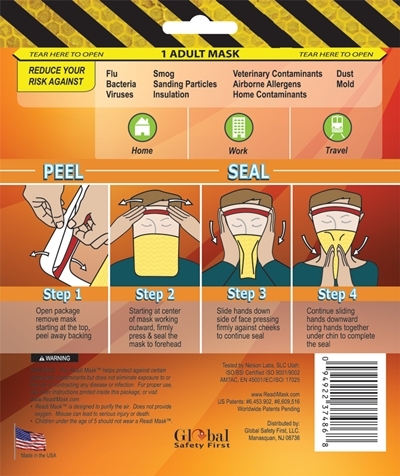 This DVD is a true multimedia presentation, containing tens of thousands of pages of printable documents, including Civil Defense documents, Military Field Manuals, NBC Prep, Medical, and Survival topics. 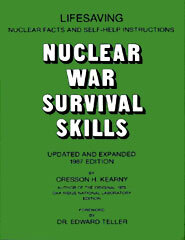 Also, a complete digital version of Cresson Kearney's 'Nuclear War Survival Skills' and the FEMA 'Radiation Safety In Shelters' book and many others. Also, new AND classic nuclear prepping videos, mp3 audios of preparedness training and advice, as well as all the content from Ki4u.com's many websites. There are 684 individual files of information with over 3,800 megabytes of data in the DVD Library, collected and programmed by Rich Fleetwood, founder of SurvivalRing.org. 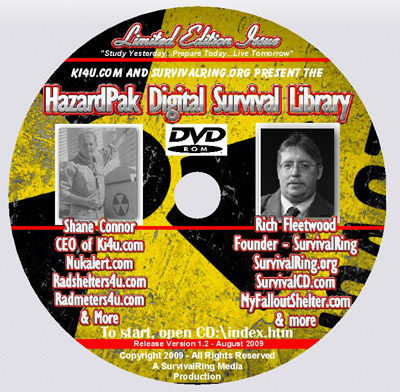 Without a doubt, here's the most comprehensive collection of Civil Defense, Fallout Shelter and NBC Survival Prep documents anywhere on a single DVD! This is everything, and more, that you could ever hope to pull off the internet in an emergency for family survival instruction and guidance, ALL in one DVD! When time is short, and the internet might even be down, this is the one DVD you'll be very glad to have then! 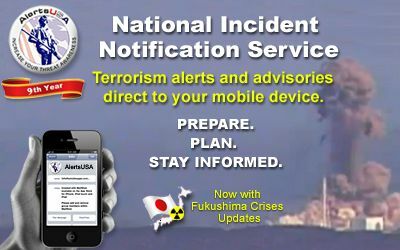 Now in their 18th year (we have known and used them from the beginning), the AlertsUSA service provides notification of breaking terrorism threats, warnings and advisories via your mobile device. It is also one of the few reliable sources of news and breaking developments in the ongoing nuclear crisis in Fukushima, Japan. If you want to stay on top of the growing number of threats facing the country, this service is for you. Go Here To Learn More! 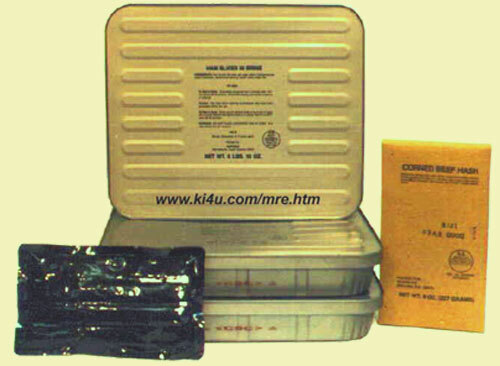 MRE's (which are pronounced as separate letters: M,R,E's) The name MRE comes from their military description: Meals, Ready-to-Eat. Great tasting, long 7-10 year shelf life, and always in high demand and short supply whenever disaster strikes. We are only taking orders for full pallet loads (48 cases) drop-shipped direct & factory fresh at a big discount as seen here MRE Pallet Load Factory Drop-Shipped Savings. If you need less than 48 cases, get together with some friends to split a case for the savings! For all other KI4U products above, call us at (830) 672-8734 Mon-Fri 8AM-5PM CST to buy anything direct! Telephone: Call us directly at (830) 672-8734, Monday-Friday, 8AM - 5PM CST. (often later, too!). Mail: Orders with checks or money orders accepted. Print out and mail the invoice provided after submitting this page. Bank wire-transfers Call (830) 672-8734 or email KI4U, Inc. for bank info. Call (830) 672-8734 or email for details. Most of these products are not available elsewhere, but for those few that are, be sure an alternate source both has it in-stock, right now, and will ship it fast, too! (And, when comparing prices, be sure you've added in their shipping/handling cost, too! Our prices already include shipping!). KI4U is focused solely on keeping in-stock only these dozen essential products offered above in the 'The Package' and then getting them out the door the same-day to you fast. No one is better stocked, cheaper, ships faster, or knows these specialized family preparation products better! First-Time Customers, You Can Find Out: More about all that we do in preparing our fellow Americans, including FREE family nuke prep survival guides HERE! At this time, for 'The Package', we are not taking any overseas orders. We welcome P.O. 's (Purchase Orders) from government agencies (U.S. Federal, State, Local) and offer Net 30 payment terms. If a competitive bid is necessary for your purchase, or assistance required in processing your P.O., please email us. We are always eager to work with NPO's, churches, schools, and other organizations who share our goals to educate and distribute these products to a wider audience. Email us your needs and let's see what we can put together here for your project. which means it was still in-stock today to order, proceed now by clicking the button below. SATISFACTION GUARANTEE & REFUND POLICY: IF FOR ANY REASON YOU DESIRE AN EXCHANGE OR REFUND (YOUR CHOICE) WITHIN 30 DAYS OF RECEIVING YOUR KI4U PRODUCT(S), WE WILL PROMPTLY HONOR YOUR REQUEST WITH THE RETURN OF THE MERCHANDISE. Contact Shane Connor with any questions regarding our guarantee and refund policy. © www.NukAlert.com 2003 - 2019. © www.RadShelters4U.com 2002 - 2019. © www.RadMeters4U.com 2001 - 2019. © www.KI4U.com 1999 - 2019.